Since 2003 I have worked on a number of projects concerning the life and practice of indigenous artist Albert Namatjira, who was born at Hermannsburg Lutheran Mission near Alice Springs on the 28th of July 1902. Following his extraordinary success as an artist Namatjira was the first indigenous Australian to be granted citizenship and the right to vote, the right to own property and the right to buy alcohol. Paradoxically in 1957, at the height of his fame, he was sentenced to six months in prison for having left a bottle of rum where other indigenous persons could access it. Though he was granted a reprieve after having served two months of his sentence his health quickly deteriorated and he died in 1959 of heart disease in an Alice Springs hospital. Albert Namatjira was one of seven artists included in a project titled seven times thank you* (first exhibited at Goddard de Fiddes in Perth in 2003: then at Arc One in Melbourne in 2005 and at the Adelaide Biennale of Art in 2006) in which I acknowledged and homaged seven deceased Australian artists as ongoing creative presences in my life. I first saw an Albert Namatjira painting in 1957 on the day my mother accompanied my sister and I to the headmaster’s office to enroll us at Brighton Primary School. We had just moved from our two-room dwelling in the inner city to that seemingly faraway suburb so that we could (my father had joyfully informed a few days earlier that we were moving to the ‘country’) enjoy the clean air and open spaces of what was then outer suburban Melbourne. As we walked through the primary school’s corridor towards what was to be my fourth-grade room my mother stopped dead in her tracks and stared at a small framed print hanging on the wall. I looked up; the frame contained a dream-like, colour-filled landscape whose skies above a red earth were filled with clear blue light. She read out the artist’s name, which was handwritten on a small plaque attached to the frame. ‘The artist’s name is Namagira; Alberto Namagira!’ she proudly told me. The pride with which my mother had pronounced the artist’s name and the Fra Angelico-like translucency of the colours in his painting confirmed in my young mind that he must indeed have been Italian (Giotto and Fra Angelico had been lovingly introduced to me only a year or so earlier by my second-grade teacher in Trieste). So until I learnt otherwise much later in high school art classes I firmly believed that Albert Namatjira had been an Italian artist who, like me, had migrated to Australia at an early age. Many decades later my mother was shocked to learn of Namatjira’s real identity and the true circumstances of his life and death. 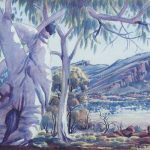 From that moment she began to believe that his painted ghost gums contained something of the artist’s presence, so much so that she was convinced they had been named so after him. I never attempted to dissuade her from her conviction because over time I also came to believe that Namatjira had been able to somehow transmute watercolour pigment into felt presence. It is strange that even when your mind knows something to impossible it can be persuaded otherwise by the parts of your being that might be in touch with a dimension more compelling than established phenomenological truths. These compelling ‘other’ truths can at times instantly dissolve the indestructible conventions that hold together our agreed beliefs, revealing them to simply be fragile tumbleweeds dancing away from us towards an increasingly distant horizon, leading those of us courageous enough to follow to the transmutative land of un-knowing. In 2013 I spent some months as artist-in-residence at Adelaide’s Flinders University researching Albert Namatjira’s life in order to prepare my contribution to a project titled ‘crystal palace’, which was to be presented at the Flinders University Gallery later that year. During my residency I became aware that Albert had been a lover of American popular music of the 1930’s, 40’s and 50’s, especially the songs interpreted by singers, musicians and composers such as Louis Armstrong, Billie Holliday, Ella Fitzgerald, Irving Berlin, Etta James, Billy Eckstine, Nat Cole, Lena Horne, Cole Porter, Duke Ellington and so on. He had also been a great lover of slow dancing as well as an able exponent of that art, but was never able to participate in social events because of the segregation policies that the organizers of such events adopted at the time. These popular ballads (from the late Latin ‘ballare’, or songs to dance to) embody the wistful and romantic musical space of a narrative poem, which Albert so enjoyed. The lyrics describe lived experience as the poetics of heart while the accompanying melody underlines and supports the narratives of the song’s emotion; the whole is then embodied, by those moved enough to do so, through the art of dance. To my mind the lyrics of these ballads (written mostly by disenfranchised African-American musicians or by eastern European migrants who had fled from war-torn Europe’s in order to find redemption in the US) transcend both cultural specificity and time. In so doing they propose an English language equivalent to the haiku, the ancient four-line poem form developed over many centuries by Japanese Zen poet-monks in order to best describe both the paradox and the wonder of being human. Tonight here at ADFA, In order to commemorate the approaching 114th anniversary of Albert Namatjira’s birth, I will present songs for albert from the end of twilight until the rising of the waning moon. As Donald Mayne and I immerse ourselves in these songs I invite you to join him on the dance floor so that together we may celebrate both his work and his life. Thank you Donald Mayne (trumpet and reeds), Ross Lake, Helen Vivian, Una Rey, Graziella de Clario and most of all thank you Albert. *The remaining six homaged artists were Clarice Beckett, John Brack, Ralph Balson, Emily Kngwarreye, Howard Arkley and Grace Cossington-Smith.